For additional information on our Quick Chopper, please email Gift Find Online at info@giftfindonline.com. A slight turn of the handle will cut, chop, mix and beat! An alternative to the electric chopper, its simple, easy, compact, and has stainless steel blades. Great for salads, omelets, vegetarian food, fruit yogurt, baby food, ketchup, fruit sauce, & vegetables. Egg beater included. To Pay For your Quick Chopper by Credit Card Click on the Add to Cart Button and follow the directions. To Pay For your Quick Chopper by Check or Money Order click here for directions. 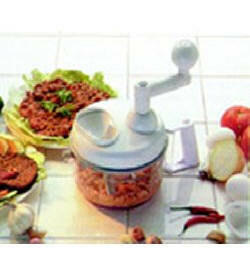 Gift Find Online provides you with quality products like the Quick Chopper at a great price. Once you order your Quick Chopper expect delivery within 5 to 7 business days. If you would like a tracking number for your Quick Chopper email us at info@giftfindonline.com . Order your Quick Chopper today! We have found hundreds of uses for our Quick Chopper. Leslie B. Our Quick Chopper allows us to prepare meals in a much shorter time.